Water protection areas cover 347,000 ha or 17% of the Slovenian territory. Water protection areas are protected by municipal ordinances and governmental decrees. They have been designated in order to protect water bodies that are used, or are intended to be used, for the public drinking water supply against pollution or other burdens that might affect the quantity of water or its suitability for human consumption. The size of a water protection area must be sufficient to allow the protective measures to effectively ensure long-term sustainability of water quantity and quality in an exploited water source. Depending on the distance and time required for groundwater or surface water to reach the water supply well, water protection areas are subject to protection regimes that distinguish three levels of strictness. · To designate water protection areas, primarily in densely populated areas, in order to protect water bodies or parts thereof that are exploited or are intended for the public drinking water supply or the production of beverages from pollution or other burdens that would affect water quantities or the suitability of water for human consumption. 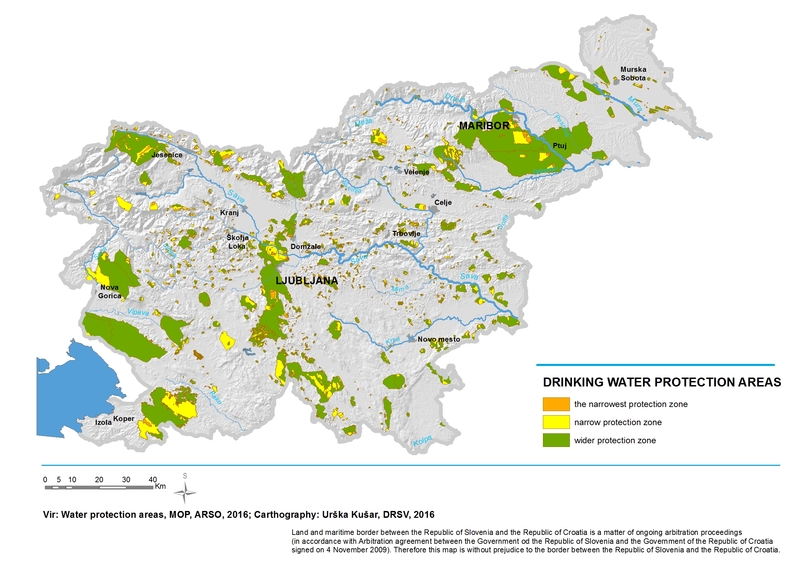 Water protection areas comprise almost one fifth, or about 347,000 hectares of the territory of Slovenia, of which more than 8,000 hectares fall under the strictest protection regime. Water protection areas are mostly covered by forest (60%), followed by agricultural land (31%). Other predominantly natural areas cover 3%, while urbanised areas cover slightly less than 6% of water protection areas. This structure is very similar to the land use structure in Slovenia as a whole. In the period 2009–2016, changes in the structure of land use in water protection areas were not significant. 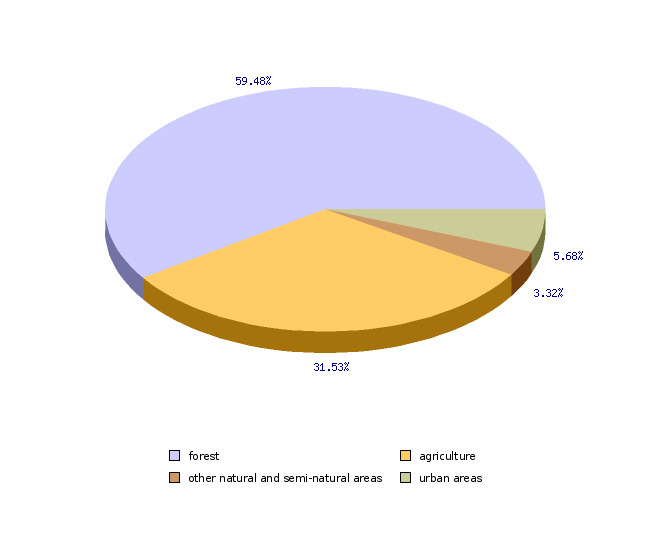 Forest areas decreased by 1.4 percentage points, mostly due to the expansion of agricultural land (1 percentage point). The highest increase was recorded in areas covered by trees and shrubs. Permanent grassland and pastures cover less than half of agricultural land in water protection areas. Arable fields cover 11% of water protection areas. The share of urbanised land in water protection areas increased only slightly in the period 2009–2016 (by 0.2 percentage points or less than 600 hectares); nevertheless, from the perspective of water pollution, expansion of urbanised areas can be regarded as undesirable.